Editor’s Note: Every winter, we dig into our closets and pull out all our winter riding gear hoping to remember what worked last year. Garrett put together his favorite items to get you riding in any winter weather. Here’s what he wears. 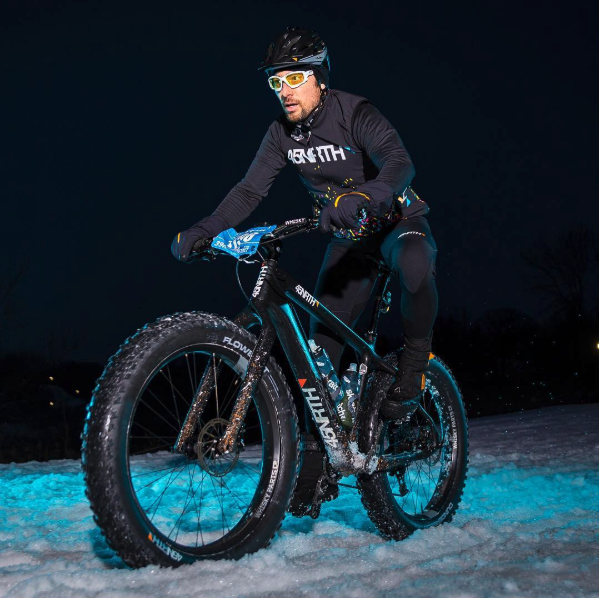 For many in the United States, the 25-45ºF (-4°-7°C) range is the bulk of winter riding season. While factors such as sunlight, humidity, precipitation and elevation can complicate things, this is my go-to mix of items for riding in the front range of Colorado. I like to start with a great base layer. The 45NRTH wool tee is an athletic-cut wool t-shirt and is particularly great in cooler months because it’s soft, warm and wicks moisture. It also has the beautiful quality of merino which makes it highly resistant to retaining bad body odor from working out or daily use. For riding, I like to size down from what I would normally use, and what was originally a great t-shirt becomes an incredible cycling base layer. It also fits well under my short bibs … I know it’s cold, so why would I wear short bibs? We’ll get back to that in a second. If it’s in the 20s, I’ll double up on long sleeve jerseys, but still won’t use a jacket since that will often trap my sweat and eventually make me cold. Overheating means sweat and sweat means cold. Topping my torso off is the 45NRTH/Podium Wear team vest. This cuts the wind and I love how it also features three rear pockets so I can access my food, phone, etc., without unzipping to reach my jersey pockets. Back to my bib selection. In warmer winter months I like to wear a thermal bib short with leg warmers. Why not full tights? Well, I like how bibs fit and I love the versatility of layering. If I’m cycling at 45ºF, I can use a merino or super lightweight leg warmer. If I’m cycling in the 20s, I can just run with thermal leg warmers. In both cases, your larger leg muscles get maximum insulation and warmth without cooking the rest of your legs. My current favorites are the Rapha classic thermal bib and leg warmers. I sincerely love our 45NRTH socks. With high thread counts, these merino-blended socks breathe well, don’t stink and add a little visual pop to my kit. For most days in this temperature range, I go with the Lightweight Merino socks, which give my feet some warmth without bulk that would consume the dead air space within my boot. That dead air is crucial for warmth. I often find a thinner sock actually keeps my feet warmer. For boots, you can’t beat the 45NRTH Ragnarok. While we call these a “transition season” boot, as long as your dogs don’t run crazy cold, this piece of footwear is a great all-around winter boot, depending on your riding climate. On my hands, I wear the new 45NRTH Nokken. If I go out longer than a few hours, I’ll also bring a set of 45NRTH Sturmfist 5’s, just in case the weather goes south or I plan to descend from high elevation for a sustained distance. For headwear, I like the versatility of the 45NRTH Greazy. With full merino wool construction, this hat has great articulation over the ears and the brim protects from wind, sun and snow. As for additional accessories, because I’m a recovering racing nerd, I rarely ride without my Garmin 520 bike GPS. My POC Octal helmet keeps me visible and safe if I encounter a fall. For eyewear, you can’t beat the superior optics of Oakley sunglasses. My favorite for colder days is the Radar EV with photochromic lenses, which features great coverage and the ability to change with light conditions. Lately, I’ve also been bringing my Fuji XT-10 with 18/55 lens packed on my handlebars in an outer-shell drawcord handlebar bag. You can usually find a Honey Stinger in there, too. It’s one of my favorite winter riding foods, and I just love the waffles. Finally, ending a ride with a good beer is best. While I can’t get them out here in Colorado, during my time living in the upper Midwest, I grew to love Blackrocks Brewery’s Coconut Brown.